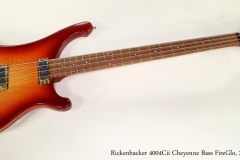 The Rickenbacker 4004Cii is a bass we don’t see very often. Built using largely American farm-grown sustainable woods, this bass uses a body of Maple with Walnut core, and an Eastern Maple neck with a Bubinga fingerboard, running the length of the instrument. The 4004Cii Cheyenne uses the classic Cresting Wave body shape originally designed by Roger Rossmeisl in the late 1950’s, and still vibrant and evocative today. Hardware is gold plated, with a Schaller type fully adjustable bridge and a pair of humbucking pickups wired in mono – this bass does not provide the Rick-O-Sound output feature. The scale length is slightly shorter than other models at 33.25 inches. Tuners are gold-plated Schaller models. 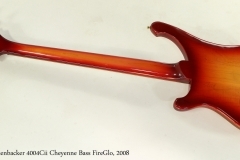 This example was completed during the week of November 13, 2008 at the Rickenbacker shop in Santa Ana, California. It has a lovely FireGlo finish, and is in very clean, original condition. It was recently set up and plays well. The original hard shell case is included.